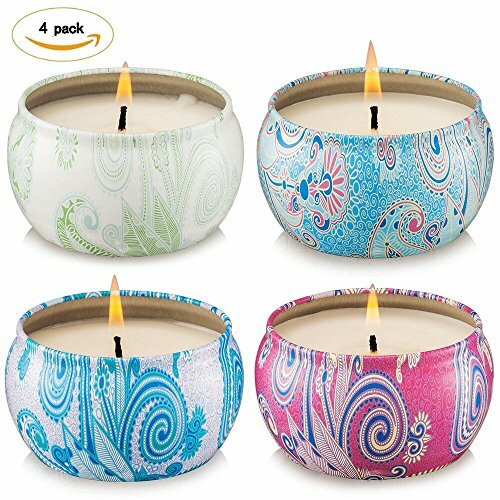 Scented Candles 4 Pack Gift Set - Vanilla,Lemongrass,Lavender and Rose, 100% Eco-friendly Soybean Wax Travel Tins Candle with Essential Oils & Easter Day Gifts by Uwax at Home Decor Outlet Store. Hurry! Limited time offer. Offer valid only while supplies last. CAUTION: Burning it no longer than two hours each time. Take care not to let these goods be burned on! Place it on a heat resistant surface only. The aromatherapy candle gift set includes 4 Fragrances : Vanilla,Lemongrass, Lavender and Rose. A portable tin candle, which can be sealed and taken with you wherever you go. Ideal Gift Set: The ideal relaxation set for birthdays, Christmas, anniversaries, Mother's & Father's Days, or other holidays that will delight people of all ages.